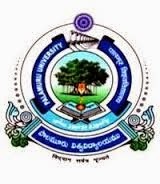 PU Mahabubnagar Notification 2018.Palamuru University, Mahabubnagar has released a notification for the recruitment of Academic Consultant purely on temporary basis in the following Departments at University PG College, Mahabubnagar, PG Centre Jogulamba Gadwal, PG Centre Kollapur and PG Centre Wanaparthy for the academic year 2018-19.Check the eligiblity and notification prior to apply for the positions. Department: MA English, M.Sc. Chemistry (Organic Spl. ), Physics, Zoology, M.Com. Qualification: Preference will be given to Ph.D./ NET/ SET/ PG teaching experience. Last date to send filled in application forms by post: 30.08.2018.